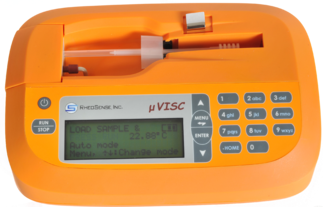 Portable, Battery Powered Small Sample Viscometer | RheoSense Inc.
microVISC-m™ viscometer is widely recognized in the industry as the fastest, easiest, and most cost effective way to assess the overall health of lubricating oil. Early detection of problems in lube oil is essential for machinery, bearings, generators, or any rotating equipment. Lube oil can be affected in many ways — oxidation can occur, it can become contaminated from fuel, water, or refrigerant leakage, or it can mix with exhaust from the pistons introducing soot. Additives in the oil also breakdown over time. When lubricating oil quality declines and costly equipment failures occur. microVISC-m™ measures the viscosity of an oil and uses ASTM methods to report the kinematic and absolute viscosity of an oil and uses ASTM methods to report the kinematic and absolute viscosity of the sample at the desired reference temperature (s), typically 40 ºC, 50 ºC, or 100 ºC, allowing for easy determination of oil health. The rectangular slit method employed in the measurement is incredibly fast and easy to use with little to no training. Data generated with microVISC-m™ is also stored with date and time stamps for traceability. microVISC-m™ is a handheld, battery-operated analyzer that is ideal for lab or remote field measurements. The re-chargeable battery can perform up to 100 measurements in between charges, giving the unit true portability. Up to eight different types of oil can be pre-programmed into microVISC-m™ at a time, which allows operators to recall setups at the push of a button. Disposable pipettes reduce the risk of sample contamination, and an automated cleaning capability means no clean up between samples.